historical depictions of early Canadian life, specifically Newfoundland. Sheilagh has delivered her daughter named Leah and is attended by the district nurse, the local midwife, her mother, and her sister Claire. Leah is premature and she spends the first weeks of her life inside a “just-warm” oven, coming out only for feedings. Leah does live, despite the nurse’s concerns. Life continues for Sheilagh, as she spends her time caring for the needs of her family, or putting up food for the long winters. The depictions are not a simplified, agrarian idealism. This is a book depicting the gritty realism of eating nothing but fish and cabbage day in and day out. People die regularly of common diseases, and one looks forward to small things like the Christmas dance all year, because it is the only time to have fun. The community must rely on each other to survive, for good or ill.
What keeps Sheilagh’s spirit alive and joyful is the love she feels for her daughter Leah. Sheilagh loves her husband Peter, but they often disagree or are disconnected from each other’s realities. She does not wish to go through childbirth again although her husband tells her he would like a son. Sheilagh secretly rejects the authority of her husband over her own body by using birth control. Claire, Sheilagh’s sister, feels called to greater things than the sustenance scraping of Rennie’s Bay. She tosses aside the love of a handsome young man of her community. Claire gathers her courage and leaves Rennie’s Bay, rejecting the hold of the community. Through both of these narratives, the reader is also given glimpses of the local midwife and her role of healing in the community. With the same objectivity, we are privy to the thoughts of the district nurse and her sorrow in tending to the physically horrid lives of the people in these remote communities. The nurse was often broken by people’s readiness to use superstition and prayers, rather then simple medical procedures. One woman dying at fifty, felt that she had lived a long and good life. This was a powerful book. It is short and wonderful addition to Canadian Literature. I continuously thought of The Birth House, by Ami McKay (click here for my review), because it is a similar setting in time and place. But, all the complaints I had with The Birth House are redeemed in this book. Sheilagh’s Brush covers the same issues realistically, rather than idealistically. Hanrahan reveals the story with elegance, without pushing her own agenda. The characters were vivid and historically faithful. The novel captured the complexity of a cast of characters that I appreciate so much in a novel. We feel for Sheilagh’s desire to not have children, but we also feel sorry for Peter, who just wants a son to work with him someday. The most compelling and intelligent part of the novel, was Hanrahan’s theme of traditional medicine vs modern medicine. In The Birth House, it was very clear readers were meant to feel that modern medicine was the enemy, and had taken away the respectful and traditional ways of women. That view is entirely too simplistic. Sheilagh’s Brush shows both sides. The reader sees the midwife’s lifesaving care through keeping premature Leah in a make-shift incubator. But we also see the bizarre superstitions that cause harm, such as putting an axe under the birthing bed to take away pain (rather than giving pain medication in a hard labour). The midwife insisted on weaning all babies at nine months lest the mother should poison their babies through their milk. The nurse knows these things are only superstious traditions, and still tries to work within them to bring relief to people. If you liked The Birth House, and it’s themes, please read this one. It is not lighthearted, but it is stunning and realistic. ALSO: Go ahead and read my review of The Birth House. I just finished an insightful book called Farm City, the Education of an Urban Farmer. I would love for someone else to pick it up and read it too. someone who enjoys honest and humorous non-fiction. 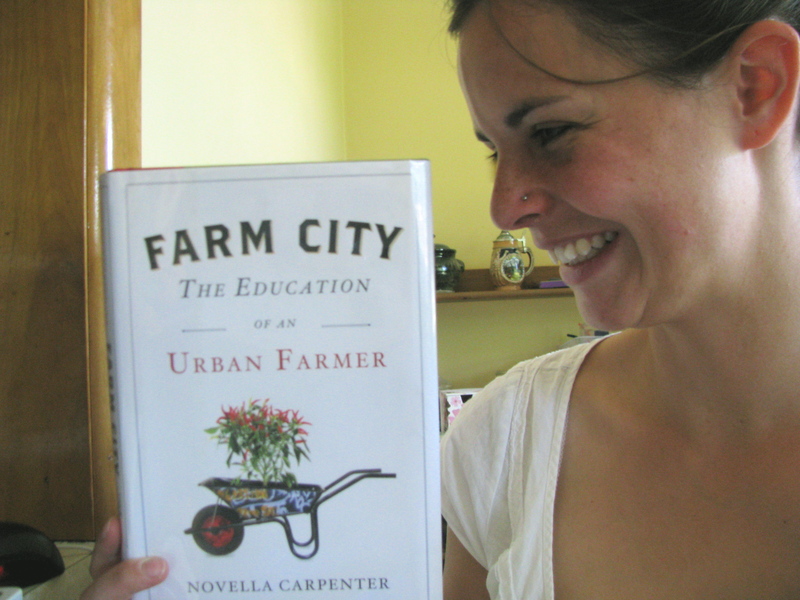 In Farm City, The Education of an Urban Farmer, the author Novella Carpenter introduces the reader to her “homestead”. This is a non-fiction account of Carpenter’s farm in Downtown Oakland, California. It sounds like a familiar place, a downtown with regular violent crimes, highways beside decaying and abandoned buildings and old homes turned into apartments with absentee landlords. In an abdicated city lot, Carpenter raises beds for vegetables and fruit and builds pens for her animals. Animals? In the city? This eccentric and somewhat crazy woman actually tends livestock in downtown Oakland. This leads to wild tales of turkeys killed by junkyard dogs, hens clucking down sidewalks, and neighbours complaining about the smell of her pigs. Oh yeah, she has pigs…. which she feeds entirely by dumpster diving at local restaurants. Carpenter’s passion is personal food production. She wants to know her food and be enriched by it. Home grown food resonates with me too. I have slowly developed a unease with the grocery food business. Grocery stores provide us with necessities; but food comes to us with no endearment and at great environmental cost. Homemade food thrills Carpenter, and she loves the value it holds. Each spinach leaf tangibly represents weeks of work, sunshine and water. She is so close to her food that on cold nights, her young poultry stay in her living room. And she still thought it was worthwhile, even when she had to gulp down (pun intended) all reserve and kill and roast her own rabbits. She considers food production part of our cultural history. We have innate desires to “make” our own food. She claims this is our heritage, and I understand this. I still enjoy gardening, even though summers of my childhood included weeding. My grandmother, at 76, still puts up enough veggies for the winter. Carpenter thinks such good and perfect things need not be sacrificed for city life. I kept thinking of Kingsolver’s Animal, Vegetable, Miracle. A detailed memoir in which the privileged Kingsolver gives up an urban “unnatural” life in Arizona to live in a backwoods farm, committed to growing most of her own food. Carpenter is very clear that city life is interesting, less isolating, and just as natural. We don’t have to be hermits to be farmers. It made me feel proud to be city-folk, (even though I grew up in very rural Ontario). Conscientious food consumers don’t have to pine for the country. I still occasionally yearn for the idyllic country, but having lots of space is not the only way to solve the grocery store conundrum. It made me rethink preconceptions about farming and food production. She had considered herself better than people who ate carelessly and only knew how to use a microwave to reheat frozen dinners. There are more important things in life then what food she eats and where it comes from. There are bigger issues in this world. I liked that the best about this book; Carpenter was convicted but compassionate. There is nothing worse than a self-righteous eater, when basically we are all just trying to survive. It would be hard to believe this woman’s story, but she writes with such authenticity. I am new at this “urban gardening/ food production thing,” but I was inspired. The book extrapolated very clearly that urban food production is not a new or radical idea. Cities like Shanghai, produce 85% of their own food within city limits, and have done so since the beginning of memory. So we are giving it a go: my family and I have a tiny spot in a friend’s plot at the local Hill Street community garden. And things are growing. It will be a good bean year, and every time I go to see the garden I am thrilled. I liken the feeling to watching my children smile. It’s mesmerizing, and the spinach and greens are tender and not even a bit bitter. The humour in this book, her wry sarcasm and honesty (my favourite part was when she confessed to actually having a sizable grow op when she lived in Seattle), even her occasional F word slip, made me feel like we were close friends. I was also encouraged because this book is about love. It is about love for a city and community, and for nature that can coexist. And it is about the good feelings that come from building up your neighbourhood. Even if it’s something as simple as sharing homegrown food.